To enjoy a festive, spiritually rewarding bar or bat mitzvah, you need to understand the meaning of this revered rite of passage and learn how to plan a celebration that reflects your family's personal values and style. But with such a variety of ancient rituals, new traditions, and contemporary party practices to choose from, preparing for this milestone event can seem overwhelming. 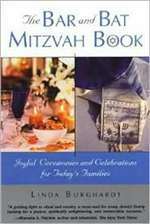 The Bar and Bat Mitzvah Book is an indispensable guide to planning a family-oriented celebration that is filled with depth and meaning.